Wearable tech is a market that’s set to flourish as new devices and gadgets that make our lives better, and easier, are introduced. The applications and possibilities for what is being offered and developed are seemingly endless. Perhaps nowhere however, will the impact be more beneficial than in healthcare and more specifically, consumer fitness devices. Wearable fitness gadgets collect and measure data based on an individual’s performance and physical condition and can be used for personal goal setting and improvement, or even by doctors and caretakers for health checks. This market is starting to gain more excitement as benefits are recognized. 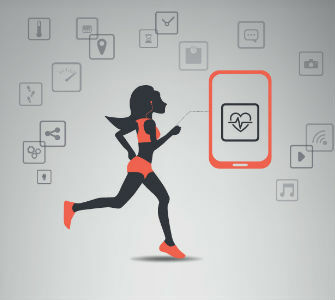 Juniper Research predicts annual revenues from connected healthcare and fitness services will approach $2 billion by 2019 – which is nearly 6 times the $320 million value that is estimated for this year. According to Juniper, not only will these devices be critical for users, but also stakeholders who can utilize data collected to improve preventive care, can find benefit. This, once kinks in privacy and personal data sharing are worked out, could also significantly drive up adoption. Especially as standards are developed to ensure reliable data is being generated. Looking at the market with similar hope, Parks Associates just released estimates that global revenues from connected fitness trackers will hit $5.4 billion by 2019. This estimate is part of a new research report, Digitally Fit: Products and Services for Connected Consumers” that looks at current adoption and usage rates for connected health devices. "Health is an important part of the connected home, but the market is different from other CE and smart home markets, due in large part to consumer motivations for adoption," said Harry Wang, Director, Health & Mobile Product Research, Parks Associates. "For instance, age is not a consistent predictor of health tech adoption as it is for other tech markets, and different consumer segments have varying motivations for adopting health solutions. Companies in the connected health space must be mindful of their target market when designing their solutions and marketing messages." Of the fitness devices gaining most popularity with consumers currently, Parks Associates found digital pedometers with wireless connectivity and exercise equipment with built-in app support to be the most popular. The Wearable Tech Expo, happening July 13-15 at the Jacob Javits Center in New York City, will feature discussions on the topic of security with wearables as well as commentary on the fitness craze with trackers today and where the future lies for those devices. Also, telehealth and the important role wearables plays in the healthcare vertical will be discussed.